When it comes to garage doors in Seabrook TX, there's no one more qualified to assist you than the experts at Henderson Garage Door. Specializing in the sale, installation, service and repair of residential and commercial door systems, Henderson has been serving the community since 1989. As a family-owned and operated company, customer service has always been our first concern and will remain the number one concern as long as we are in business. 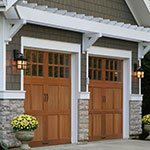 We understand how big the decisions are when it comes to repairing or purchasing a new garage door. At Henderson, we make sure to help you select the best option for your home and budget. We're known for our prompt, professional, and reliable service, and we'd like to keep it that way! Call us today to request service or receive an estimate.